Voice of America is owned by the United States government. But it performs as if it were an international broadcast company. Its goal is to send American news to countries throughout the world. Some consider this to be American propaganda. 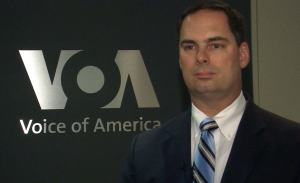 But VOA believes it is an important way to broadcast events like the 2013 Presidential Inauguration.“The inauguration is a huge symbolic moment for democracy in the United States and that is something that translates well around the world,” says Jim Malone, a National corespondent at VOA. “This is one of those enduring democratic symbols that is worth exploring, talking about, and showing to the rest of the world.”Alberto Mascaro is the VOA director of its Latin America Division which broadcast the inauguration in Spanish. He says the inauguration is a perfect opportunity to show countries how a democracy works.“This is just one of the processes that clearly states how a democracy works,” says Mascaro. From the conventions, elections, and swearing-in ceremony, [the Inauguration] really shows the world how a president is elected in the United States.”VOA is broadcasting the Inauguration live but is not expecting as many international viewers as there were 4 years ago.